Could your family room use a makeover? 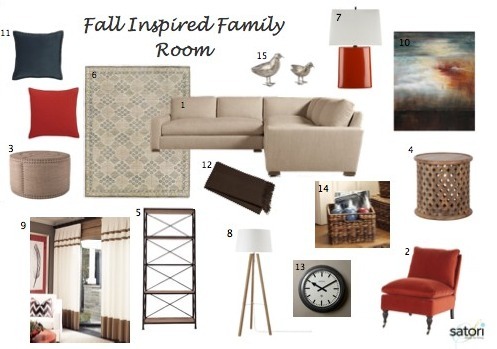 Get inspired by these fall decor and furniture picks in deep blue, burnt orange and neutrals. So cozy! After meeting with my clients to discuss their family room and check out the room’s specifications, I knew this plan was going to require some careful consideration. The family had already ordered a sectional from Restoration Hardware (a big ticket item) and wanted to use the side board they inherited from a grandparent in some way or another. I had previously created a plan for Phoebe’s home office, so I had a pretty good sense of her design style. Although I was given a significant budget to work with, this room had to incorporate the whole family and a lofty wish list. I knew it would be somewhat of a challenge. To set the tone for your family room, paint the walls a warm gray-brown, such as Weimaraner (AF-155) by Benjamin Moore Paints. You can freshen up your trim work in the same color you currently have. Paint your existing side board in a dark teal, such as Blue Danube (2062-30). Replace all hardware with simple cup pulls like those from Lee Valley in an antique pewter finish. Once you make these changes to your side board, it will be perfect to hold your TV, as well as for provide extra storage. Note: Refer to the Storyboard above for number/photo reference. 1. The Maxwell corner sectional you have already ordered from Restoration Hardware is a great choice and will determine the layout for the room. Given it’s large scale, it will easily provide the seating your family requires for TV watching. 2. Choose an armless or smaller-scaled chair to face the sectional on an angle. I suggest upholstering it in a burnt orange color to bring warmth and color into the room- see fabric sample. The Zondra chair from Jayson Home is on casters, making it easy to move for extra seating while watching TV or playing games. 4. Add a small round wooden table beside the accent chair. The Village table from Jayson Home is unique and introduces an interesting pattern to the room. 5. Place two large open style bookcases on the wall behind the sectional. I suggest something in a wood/metal combination, such as the Rockwell bookcase from Jayson Home. Fortunately you have overhead recessed lights that supply ample lighting. I suggest putting them on a dimmer to be able to adjust the lighting as needed. 7. Place a table lamp on the side board closest to the chair. I suggest a pop of color, such as the Boka lamp in persimmon from Crate & Barrel. 8. Place an oversized floor lamp beside the sectional. The Tripod lamp from West Elm will provide good lighting for reading and add a touch of whimsy to the room. Install a drapery rod, such as the Standard Oversized rod from Pottery Barn in pewter. The brackets should be installed about 16″ outside the casing and high enough so the top of the rod sits about 5″ below the ceiling. This will make the window appear larger and will provide better acoustics. 9. Hang double-width linen drapery panels with ribbon or banding detailing on either side of the window. The Hampton drape from Drape Style would look stunning in eggshell as the base color and burlap or mosaic blue as the banding. 10. Hang a large piece of artwork between the bookcases behind the sectional sofa approximately 42″ from the floor. Choose something that incorporates the room’s colors, such as Calypso canvas from Urban Barn. 11. Add at least four decorative pillows to the sofa in varying sizes and fabrics. The Eclipse pillow in mandarin from Crate & Barrel and Studded Velvet pillow in regal blue from West Elm add the pop of color needed and are easy to clean with their zipper closures. You can add a large patterned and/or striped fabric if you want more pizzaz. 12. Place a cozy throw on the end of the sectional sofa in a deep color, such as the Lima Alpaca throw in brown from Crate & Barrel. 13. Hang an oversized clock on the left side of the side board (above the accent chair) like the Metropolitan clock from Restoration Hardware. It will balance out the floor lamp and add interest to the space. 14. Place large woven baskets on the bottom shelves of the bookcases. These can be used for storing toys, games and other items. Select baskets that are durable enough for the kids to be able to lug them around, such as the Havana basket from Pottery Barn. 15. Style the remaining shelves of your bookcases with your existing books, frames, small mirror, decorative boxes, etc. I suggest adding a bit of whimsy with items like these Metal Birds from West Elm. See bookcase styling sketch for further instruction. Add your own personal touches to the room, such as fresh flowers and framed family photos. From concept to completion, Satori Signature Room Design is a comprehensive package that gives the step-by-step details you require to transform your space, whether you’re starting with a blank slate or working with an existing space. We take the guesswork out so you can move ahead with confidence. Our plans reflect the notion that design isn’t about keeping up with or being the Joneses. It’s about being the authentic YOU and feeling at home. Please contact us if you’re interested in a plan of your own or any one of our other services. This room is fabulous!!! I love the selections! You met your clients needs to perfectly! Thanks Tiffany. It was a fun project to work on. They are very happy, which is always great to hear (as you know)! Thanks for popping by! Looks and sounds like a great design plan! Looking forward to seeing the finished project! Thanks Arianna! They were great clients to work with. 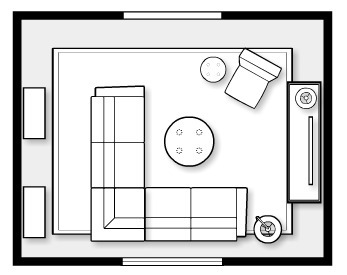 I am currently putting together a plan for our family room and I think I’ll be using a similar layout. Have a great weekend!